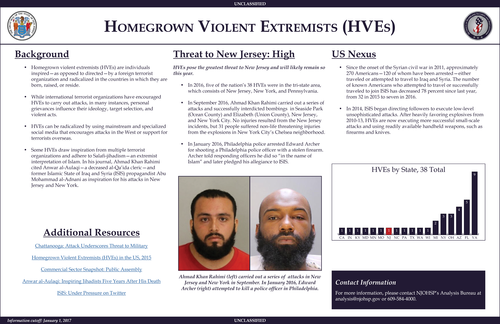 Homegrown violent extremists (HVEs) are individuals inspired—as opposed to directed—by a foreign terrorist organization, and radicalized in the countries in which they are born, raised, or reside. While international terrorist organizations have encouraged HVEs to carry out attacks, in many instances, personal grievances influence their ideology, target selection, and violent acts. HVEs can be radicalized through posts on social media—including Facebook, YouTube, and Telegram—that encourage attacks in the West or support for terrorists overseas. In the year ahead, HVEs will remain New Jersey's most compelling threat. Join us as we discuss how HVEs continue to demonstrate an ability to operate in New Jersey and throughout the region, while connecting with like-minded individuals online and acting independently from organized terrorist groups, making them difficult for law enforcement to detect and deter.